It is often with dread that we connect to the internet – what is the latest scandal perpetrated by the likes of May, Trump et al? Each contact with politics these days re-ignites a sense of outrage and frustration, mixed in with an equal portion of dread and helplessness. What will become of the UK in particular and Europe in general? What can we do on a personal level to make a difference? March 29th 2017 will go down as one of those days in history when a die was cast. So what does our March 29th look like? We wake up to splendid sunshine and despite this sense of dread rumbling in the background, we are full of adventure spirit. The air is clear and quite cold, there’s a bit of snow by the side of the road – we are over 1000 mtr high in the Silas mountains, by lake Arvo. We head off fairly early to find a place by the lake shore. It is shocking to see how low the water is, even at a time like this when the snow has just melted. We drive around the whole lake without really feeling drawn to a place, so we head on over the next mountain pass northwards. On a high plain we stop to cook a brunch and eat it outside. The light is extra bright, with the sun reflecting off the snowy slopes across the valley and bouncing off Emma too. Then we travel on, with the road winding slowly down from the lofty heights. The next time we stop, we are a good 1000 mtrs lower and back in the higher temperatures. 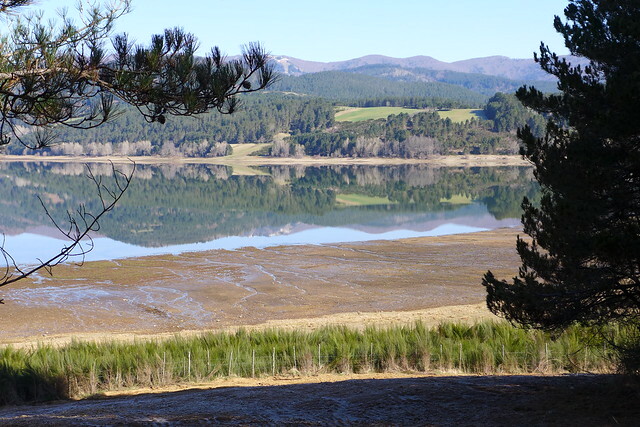 Our plan is to cut across eastwards to the sea again, but I discover that we are passing nearby a Terme, so we come off the main road and for a while wind our way along a little river and olive groves. We find the Terme, a dilapidated hotel that is closed for the winter. A farmer cutting grass tells us that it’s not a hot Terme anyway, just mineral-rich water. If we want to go to a hot Terme, we must go to Cerchiara, about 30km from here. And if they are closed, we absolutely must go and visit the gorge at Civita instead, as it’s very beautiful. So on we travel again with Emma. When we get to the Terme, we first get stuck and have to reverse up a very steep and narrow road before we find a good place to park. We meet a woman called Gina who has a herd of goats here. She tells us about her shop in a town a few miles away, selling hand reared meats and homemade cheeses and invites us to come past the shop later. The owner of the house next door where we are parked is very friendly and lets us walk across their land to get to the river. 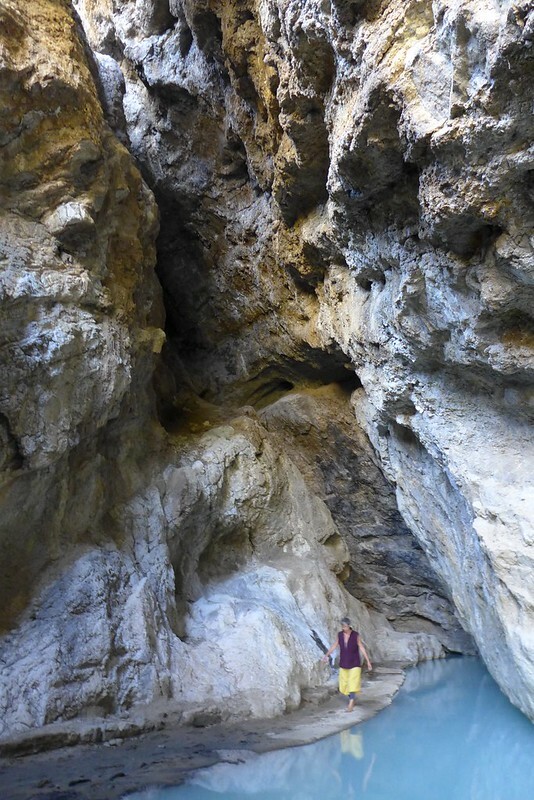 We chat with some workmen too who let us see the Grotta delle Ninfe, normally closed to the general public. I test the water and it has only just swimming pool temperatures, maybe 25 degrees. That’s quite disappointing… we can’t go bathing in the grotto anyway, it’s far too muddy in there, I imagine getting in is not the problem, but getting out might be. So we come out of the grotto, walk past the empty swimming pool and go down to the river. We find a secluded spot there and submerge ourselves, imagining it to be hot. It certainly has the right sulphuric pong to it! After five minutes, as we are about to get out and leave, we discover that we are covered in little creatures!!! For a moment it looks like we have been attacked by leeches, but luckily they are just some kind of worm that are easily brushed off. Hopefully this will not have any aftereffects, although I feel itchy all over my body again, just thinking of that moment. We go back to the van where we have some food Frank prepared earlier, then we set off to Civita, a place we’ve been recommended twice today when asking for directions. We stop off at Gina’s to buy some sausage and hang out in front of her shop with a few other locals, discussing the Calabrese dialect and spanish invasions. When they talk among themselves, we have no hope of understanding what they say, despite the fact that our Italian has improved considerably over the last couple of years. After 15 minutes, we realise we need to get going if we want to arrive before dark, so off we go, with Emma chugging up a steep hill for the third time today. 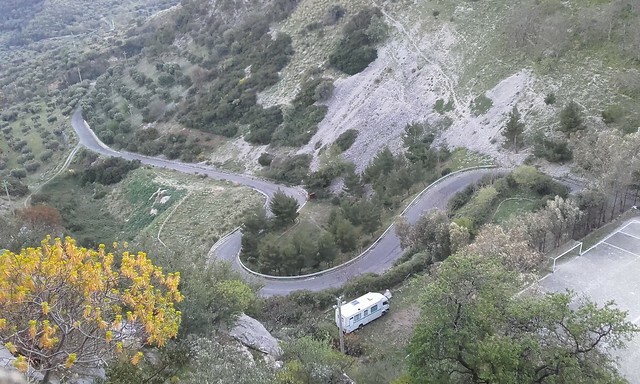 We soon turn off the main road onto a little road that gets progressively steeper and narrower, with fairly strong hairpin bends. When we get to the entrance of the village, I vote to leave the van in the car park rather than possibly getting stuck in an ancient market square. 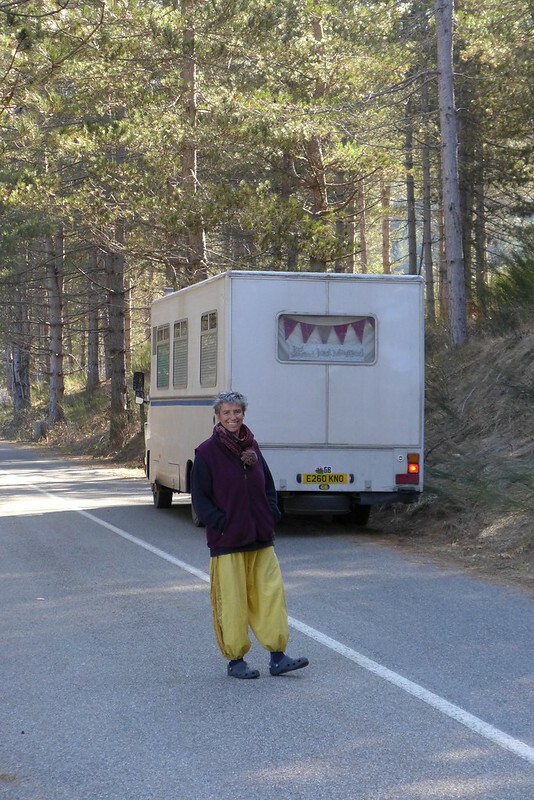 We ask a local who insists we can go through the village with our van, to the start of the path of the gorge. He offers to drive ahead and show us. Several men shake their heads and try to stop us turning down a road as we cross a beautiful ancient market square, but we follow a local, so we just shrug our shoulders and point to our navigator in front. The men in the square are right though; it is indeed very tight, with only a few centimetres short of scraping against a house on one side or hitting a balcony on the other. When we have finished squeezing through the town centre, the place our friendly guide suggested for parking is so steep that we would have to strap ourselves in in to go to sleep! Later, we take a photo of the town from above. Imagine – we tried to drive through this!!! We decide to go back to the car park out of town. Once again we squeeze through the town with everyone watching, not unfriendly at all, in fact quite smiley and appreciative of the size and shape of our vehicle. We block traffic in both directions for a few minutes while navigating balconies, but everyone seems to be sweet and smiling. We settle into a lovely off-road car park in time for dusk. 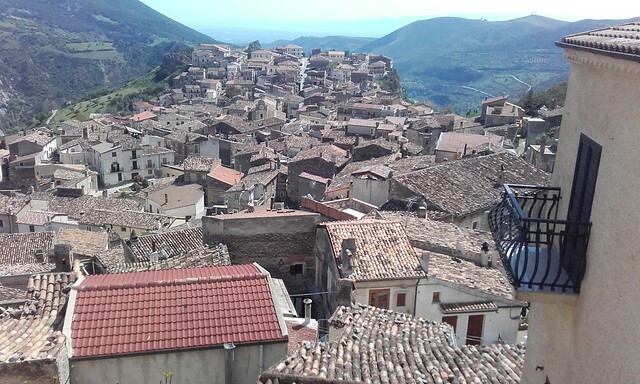 Civita turns out to be an interesting example of a historic refugee situation. 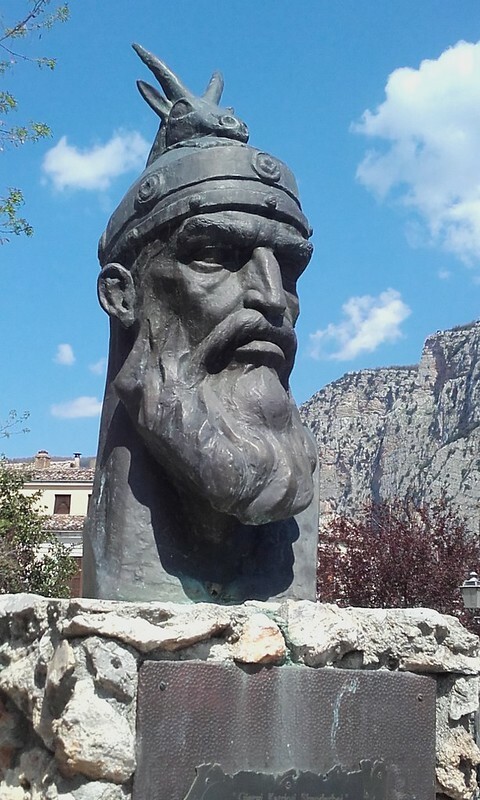 We climb the 177 steps from our car park into the centre of town and are greeted by a ferocious looking bust, definitely not an Italian face or name: Kastriota Skanderbeg. Next, we note that all street names are dual language. The museum has more relevant info: In the 15th century, after 25 years of heroic resistance to the ottoman empire, Albanians (at the time of Christian faith) had to flee from the Muslim invasions, and they came to Italy where they were welcomed due to their military leader Kastriota Skanderbeg previously having supported the King of Naples in the fight against the Ottomans. Civita one of 49 still existing Albanian communities (or Arberesh, as they are called) in Italy, was founded on the ruins of a previously abandoned city, high up in the hills about 15km distance from the sea, nestled into the hillside, hidden from view. 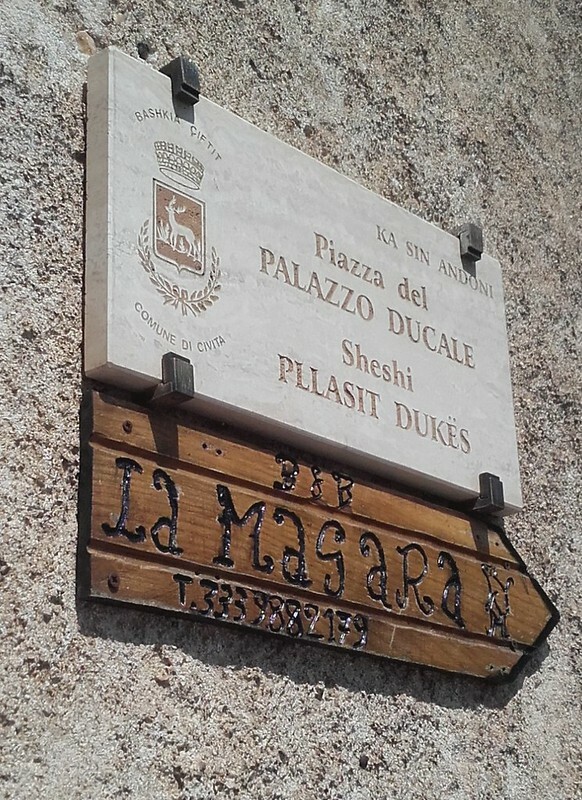 For many generations, the villagers kept themselves separate from the Italians, albeit in friendly connection. 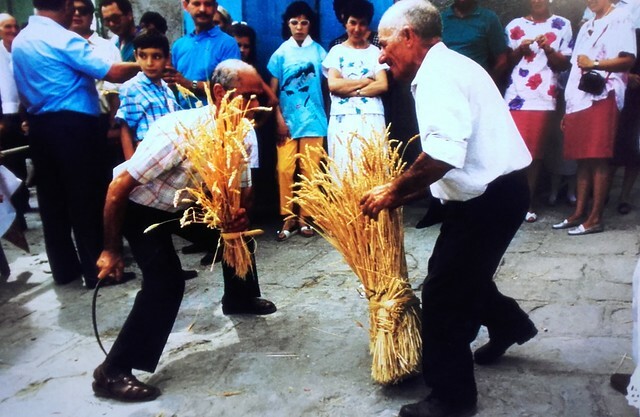 Albanian identity, customs, language and folklore have been kept alive to this day, but more recently, to the extent that the village has opened to the world, the cultures have interwoven by marriage too. I instantly think of all the abandoned villages we have come across in our two years of travelling, in Germany, Spain and France, Portugal and Italy. What would happen if Europe were once again to allow current refugees to inhabit abandoned villages and re-invigorate overgrown agricultural landscapes? Do we really think there isn’t enough space to house more people in Europe? Or am I just naive? On our way into the Silas mountains, we pass a little village called Santa Severina, perched on a little mountain. A beautiful tree is in flower, we are told it flowers always in time for Easter. 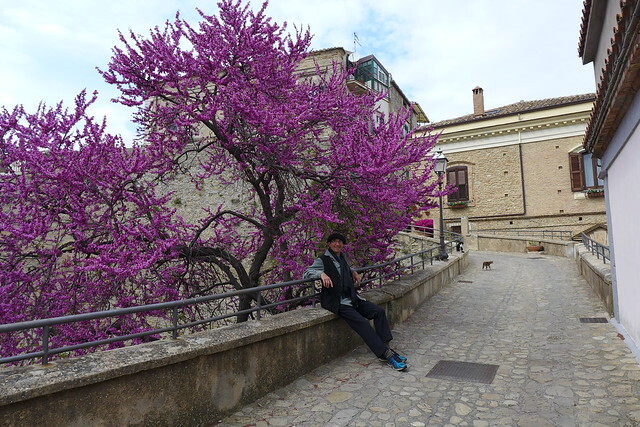 Click on the photo to view more pictures of this charming village and its castle. The time has come to leave Sicily and take the ferry to Southern Italy. We’ve heard good things about Calabria, so we are quite excited. Rolling off the ferry, we turn right to go along the Southern coast. We drive about 25km and then attempt to get down to the sea and find a little beach for the night. But our plans are scuppered by a railway line. In the following days, this railway line accompanies us for the next several hundred kilometres or so, and it’s really difficult to access the sea. There are many underpasses but rarely are they high enough to allow Emma to pass. It seems that this part of Italy is not prepared for the likes of us in campervans who might like to spend time on the beaches and watch the sea. But also the locals seem to have a curious indifference to the sea in some places: we even find benches along a promenade that are placed with their back to the sea, facing the promenade and the road instead! 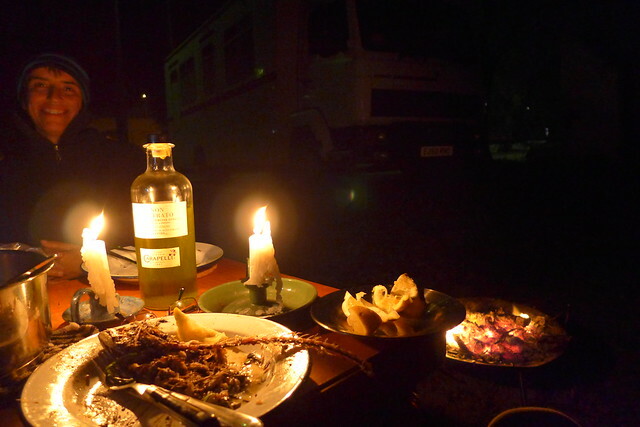 Eventually, we do find a lovely little fishing village and settle down to a romantic, candle-lit BBQ on the beach with fresh fish. We struggle to get the measure of the people here, they are very different to Sicilians. Everyone is incredibly nice and helpful, much sweeter than what we’ve been used to. Not that the Sicilians weren’t nice, but here the people really go out of their way to help you if you ask, and often even if you don’t ask. One evening, we meet a farmer who invites us to take water from his land if we need water. Frank goes over to see where the tap is and comes back with handfuls of food. 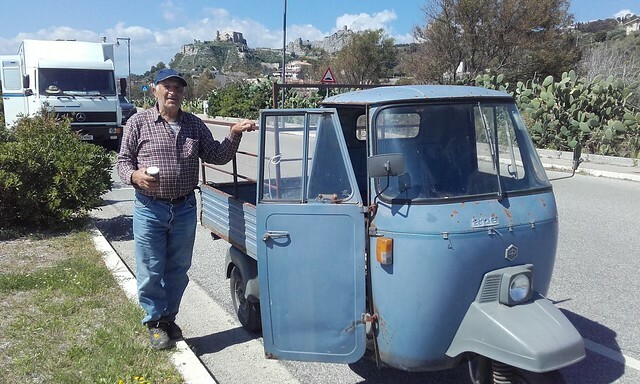 It’s bean time in Calabria, we’ve seen them already by the side of the road, neatly heaped up on the little three-wheeler pickups, next to the last oranges and artichokes. Michele the farmer says it’s nice to share food, to give food to people, and he pulls several fennels out of the earth for us, some garlic, spring onions, lettuces, lemons, fresh mint, sage, rosemary and celery. We regale him with one of Frank’s home made Sicilian Lemonade Marmalade before setting off again. Another time we stop when we see the first farmer picking Medlars, to ask if we can buy some off him. He fills a plastic bag, practically depleting his tree, but absolutely won’t take any money for it. We give his son a football instead. It seems like you have to be careful what you talk about – anything you point out, anything you mention, they give to you. Usually, we find the less touristic places nicer, but here there is no infrastructure for travelling people. It’s hard to find drinking water, postcards, and there are very few shops that sell what we would like to buy, we have to hunt for an internet cafe, and there are only a few nice places to stop and go for walks or watch the sea. So we drive on and decide to try our luck inland instead. The evening of the third day finds us 1400mtrs up in the Silas mountains, surrounded by fir trees near lake Arvo, and a view of the last remnants of snow. It is only in the middle of the night that I realise, tomorrow is March 29th, the day when our unelected prime minister actually invokes Article 50 and sets in motion the B word. We’ve been so out of touch with the internet and with current news that the whole debacle has somewhat receded into the background, but of course it’s nevertheless affecting us.